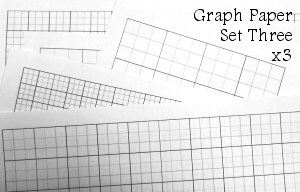 Printable Graph Paper in 18 Sizes. Includes a special file designed for six 3x4 square foot garden plots. Page also includes centimeter graph paper in 3 styles. Donnayoung.org has graph paper. I will name the graph paper based on the number of squares in width and length, except for the tiny graph paper. If I have other details such as approximate square size, that will be made known to you but please keep in mind that your printed results might not be exactly the same. The Grid Note - List This is a generator. It will render your list on graph paper. I recently inspected this set of graph paper files, printed them, and measured them. The sizes I have listed are approximate and based on two printer settings - "None" and "Fit to Paper". Basic information: The files in this set are black and white. This set can be printed in the low quality mode of draft, even the lowest setting of draft on my printer worked. All of the papers shown in the image above were printed in the lowest quality setting of draft. If you do not set to draft, expect the lines to be black and possibly too dark. Note: Draft mode is not recommended for Set 2. The setting "fit to paper" is optional. Note: Draft mode is not recommended for Set 3. The setting "fit to paper" is optional. The sizes, the first set of numbers tell how many squares wide by squares long. The sizes in parenthesis tell how many groups of 3 wide by groups of 3 long. Note: Draft mode is not recommended for Set 4. The setting "fit to paper" might throw off the finished size of the cells and the setting is optional. 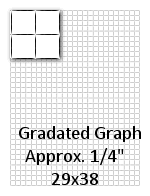 Three styles of the centimeter graph paper are shown in the image below. 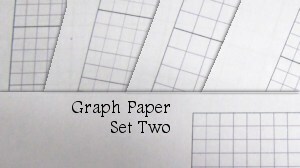 Centimeter Graph Paper with mm lines - Centimeter graph paper that is divided with light gray millimeter lines. This paper has a light gray appearance when printed, see image below. All styles feature a black line at the 5th centimeter in each direction. Each centimeter graph paper in this group has a 17cm x 24cm grid. 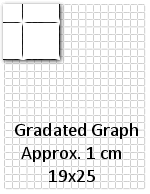 The Gradated Graph Paper (below) - I named the two graph papers gradated because the lines fade toward the intersections. I thought that it would be nice to have a graph paper with pale intersections. After test printing the files, I noticed that the pale intersections created an optional illusion of white diagonal lines. I call these gradated because when I made them (there're only two) I faded the lines in the intersections. As a graph paper user, I really liked the effect, so here we are. The squares are sized. True sized graphs are a bit difficult to achieve in the first place, and then .. the size of the squares could be thrown off by printer settings. 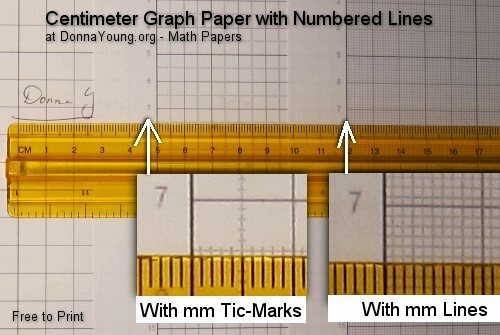 So - while the graph papers say "quarter-inch" and "centimeter" that will only mean that they are close to those sizes. DOC files will not always produce perfect squares. The Grid List that is in the left column will generate an image for you. The image contains a grid with the lower right corner cleared for your list. The list that you typed into the form fields will appear in the generated image in the lower right corner. To use the generator, type an item or a few words into each form field, keep it short or it will be cut off. You can skip form fields to create blank spaces in your list. The list can hold up to 24 items.